U.S. Sen. Bernie Sanders addresses a rally for Amendment 69 in Colorado. 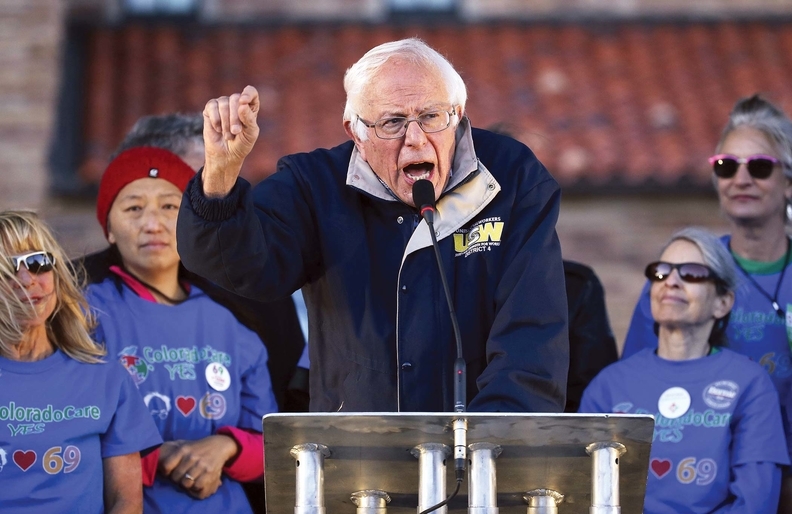 Years before Sen. Bernie Sanders touted single-payer healthcare as a core issue in his insurgent presidential campaign, a Democratic state lawmaker in Colorado was perennially introducing legislation for a single-payer system in the state. That legislation, backed by state Sen. Irene Aguilar, a physician, never gained much traction. But last year, its supporters collected more than 150,000 signatures to bring the plan before voters directly on the Nov. 8 ballot. “It grew out of frustration and out of painful awareness that people are suffering, and they don't need to be because we're spending more than we need to,” said Lyn Gullette, director of operations for the campaign behind the ballot initiative, which would amend the state's constitution. Sanders, who defeated Hillary Clinton by nearly 19 points in the state's Democratic caucus, has endorsed and campaigned for the measure. But a September poll suggested just 27% of voters were likely to support it. The plan, which will appear on the Colorado statewide ballot as Amendment 69, would establish a universal healthcare system that would finance healthcare services for most Colorado residents under a federal waiver available to states under the Affordable Care Act. The program, christened ColoradoCare, would be funded by payroll taxes rather than insurance premiums, and beneficiaries would have no deductibles and no copays for preventive and primary care. Advocacy groups representing hospitals and health insurers are warning the plan would upend the coverage expansions under the Affordable Care Act, require unsustainable tax increases and undermine competition and patient choice while failing to fix the underlying drivers of healthcare costs. Taking the initiative in healthcare: Will California voters cap drug prices? Other critics question the financial viability of the plan. An independent analysis by the nonpartisan Colorado Health Institute determined that ColoradoCare would face a deficit of $7.8 billion by 2028. Vermont passed a law in 2011 to a create a single-payer system but abandoned the plans at the end of 2014 because the state determined it wouldn't be able to pay for it. ColoradoCare would eliminate the state-run health insurance exchange and transfer those funds to the new system. Federal programs like Medicare and Veterans Health Administration coverage would remain unchanged, and residents would still have the option of buying private health insurance, though they would still pay taxes to support ColoradoCare. Benefits would include primary, mental health, specialty and dental care and be governed by an elected 21-member board of trustees who would decide benefit details and set rates for providers contracting directly with the system. In Colorado, Amendment 69: The Bernie Sanders-endorsed constitutional amendment calls for a single-payer healthcare system intended to achieve universal coverage for Colorado residents. Hospitals and health plans have lined up against the plan, which polls suggest is losing badly. “ColoradoCare will cost thousands less for the vast majority of Coloradans—over 83% of them—while maintaining and exceeding the current standards for benefits required under the ACA,” a campaign spokesman said. The new system would be financed by a new 10% payroll tax shared by employers and workers, as well as member copayments, and federal and state funds that now pay for Medicaid and other health programs. It would also impose a 10% tax on nonpayroll forms of income. The Colorado Hospital Association, which represents more than 100 hospitals and health systems, says the transition to an entirely different system threatens to stall the progress made toward extending insurance coverage to everyone in the state, which expanded Medicaid eligibility under the ACA and created its own insurance exchange for health plans subsidized by the law. The state's uninsured rate declined to 6.7% in 2015 from 14.3% in 2013. Hospitals fear ColoradoCare will mean lower rates for healthcare providers and create uncertainty for the state's hospital assessment program, which funds enhanced Medicaid payments for some hospitals as well as another program that provides discounted care for low-income residents. The Colorado Medical Society, which represents more than 7,000 physicians, surveyed 795 of its members in August and September and found that 78% would vote against Amendment 69, while 16% would vote in favor and 6% were unsure. The survey found that 88% of specialists and 72% of primary-care physicians surveyed strongly opposed it.